This polycarbonate greenhouse is perfect for growing fruits and vegetables. It provides an ideal climate for growing plants by protecting them during winter and boosting growth during summer months. Its compact design lets you grow your own fruit and vegetables even if you only have a small garden. Made from 4mm double layered alveolar polycarbonate, this greenhouse is well-insulated and very sturdy. Polycarbonate is both lightweight and 100 times stronger than glass. The wall density is 520g/m². The frame is made from a 1mm anodised aluminium, which makes this greenhouse long-lasting. Aluminium doesn't rust. The greenhouse has a number of diagonal braces for extra stability. The polycarbonateis anti-UV treated which prevents up to 99.9% of harmful UV rays from penetrating the cover. It also allows natural light to be evenly distributed and provides added insulation. This helps maintain a constant temperature and creates a climate that's perfect for growing plants. Greenhouses need air flow, this greenhouse has a polycarbonate and aluminium skylight. The skylight can be kept fully or partially open and be securely closed. It also has a practical sliding door. It's easy to open and won't slam shut on windy days. Set up your greenhouse on a flat surface. If possible, place it on a sunny spot away from trees that could block sunlight. 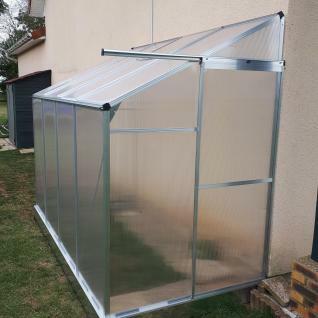 This greenhouse comes in a flat pack and can be assembled without using clips. The kit includes a base frame and galvanised steel brackets for added stability. We recommend that you install it on a solid surface such as a poured concrete floor or concrete slabs, and then anchor it to the ground in order to prevent wind damage. This greenhouse has an integrated gutter. This allows for rainwater collection which you can use to water your plants and seedlings.